And this is what I had to say. I honestly could not believe this was a national story, and on CNN for that matter. If the parents are that concerned about wanting their kid to learn how to bake then you could actually teach him, with you know, a real oven. I know, what a mind blowing concept. I guess I got worked up about this because I work retail, and people complain to me all the time about stuff like this as if I have any control over whether an easy bake oven comes in pink and not blue. 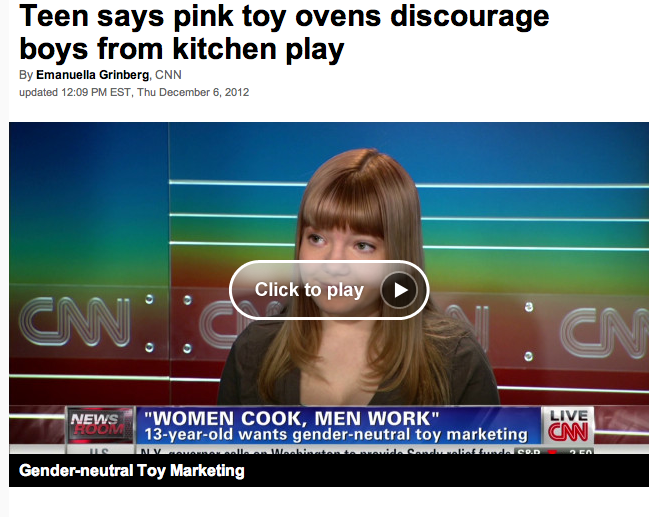 It is all about sales, and when it comes down to it, the pink is going to sell better because there are more girls that want easy bake ovens than boys. It is that simple! Hasbro is not making a gender statement. Hasbro is a business that has been around for a long time, and they know what will make money and what will not.